Impairment of a medium's transparency by the scatter radiation and absorption caused by optically denser inclusions, such as particles. Turbidity is an everyday phenomenon. We refer to it with attributes like: poor transparency, contrast reduction, lateral luminosity, etc. What is responsible for all of these effects is the optical phenomenon of light scatter. The most beautiful examples of scattered light are the blue of the sky and the red of the sunset. If a liquid or gaseous carrier medium contains foreign matter, it will occur either dissolved or in the form of suspended particles. In the case of a solution the smallest objects are molecules (or ions); in a suspension, the smallest are the individual particles - each consisting of millions of molecules. The difference between solutions and suspensions is mainly a matter of particle size. The border between them is fuzzy and varies depending on which author you read. From the standpoint of process technology, the important question is whether the foreign substance is filterable or not. Suspensions that do not lend themselves to filtration are called colloidal solutions. 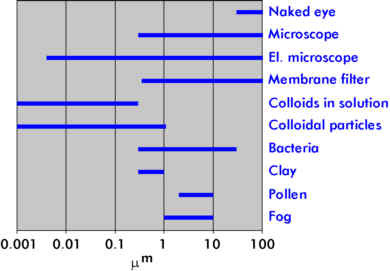 The following Figure illustrates the detection limits with various techniques and the particle size range of certain substances. The turbidity value (units: FNU, FTU, EBC etc.) is the quantitative statement of this qualitative phenomenon. The turbidity value is the quantitative statement of the qualitative phenomenon of turbidity. The objective of measuring turbidity is to obtain information on the concentration of scattering particles in a medium (solids concentration). This can be done by either of two fundamentally different methods: determination of the light loss of the transmitted beam (scatter coefficient) or determination of the intensity of the light scattered sideways. The scatter coefficient represents the total scattered light that has been withdrawn from the incident beam, while the scatter intensity states how much scattered light has been deflected at a given angle. Both variables are proportional to the particle concentration and are therefore suitable for measuring turbidity. But they differ in their applicability at various concentration levels. Measurement of the scatter intensity permits the detection of lower concentrations, while transmission measurement is used for higher concentrations. The reason for this is the phenomenon of multiple scatter. At low concentrations, the light scattered by a given particle has room to propagate freely (simple scatter). At higher concentrations, however, two things happen: the particles closer to the light source tend to screen off the incident light, and the scattered light can no longer propagate freely. As a result, the scatter intensity no longer increases in proportion to the concentration. Simple scatter is limited to about 10 FTU. In practice, however, electronic linearization makes it possible to use scatter intensity measurement for much higher measuring ranges (up to 2000 FTU). The lowest measurable turbidity level depends on how much stray light is present. Measurement of the light loss of the transmitted beam permits the detection of high concentrations, but is limited at the lower levels. The trouble is that a large number of particles are necessary to detect the reduction of transmitted light reliably. In practice, transmission measurement covers a span from 50 FTU to 20,000 FTU. Practical interpretation of the turbidity value is achieved by comparison with a standard suspension, i.e. turbidimeters are calibrated with a reference solution (usually formazine). An instrument that has been calibrated with formazine will measure any formazine concentration correctly. When it comes to other turbid media, one cannot be certain of a direct correlation between turbidity value and solids concentration, because the reading will be affected also by the particle size and the refractive index of the particles in relation to the medium. Attempts to compare the readings produced by different instruments are admissible only if they have the same characteristics with regard to wavelength of the light, scatter angle, optical configuration, calibration and color compensation. For continuous measurements in industrial processes, the measuring technique applied (photometer) is also extremely important because of the need for high stability.